I’ve been asked to say what I like and don't like about my work or my life as a geologist. These are questions that I’m rarely, if ever, asked in real life. What I’m usually asked is, what do you do as a geologist, because most people—as far as I can tell—don’t have the vaguest idea what a geologist does. When I’m asked that, I say vague things like, I map the geology out there, you know, the rocks (because I’m a rock person). Sometimes I’m asked—by people who have an idea of what a geologist might do, and who know that I work for mining companies—how is it that you find gold or whatever-it-is you’re looking for out there. Well, then I mention mapping to find out what is out there, drilling to delineate and define the ore, and looking for various hints and clues that depend on the commodity and ore-deposit type that I might think is worth looking for (or for which someone has paid me to look, if I haven’t had the chance to decide that for myself). I explain that some things look good because of past associations: certain colors in the rocks, certain types of brecciation, certain minerals, certain structural conditions, and possibly things like quartz veins if one happens to be trying to find a vein-type deposit—but maybe even if one isn’t, because quartz veining can indicate that something is going on in the area, some mineralization processes may have been at work. And I explain that, really, to understand these things, to discover something undiscovered or to further delineate something already discovered but not yet large enough or good enough for anyone to want to come in and mine, that I or someone will have to sample the rocks, because assays and geochemical analyses need to be performed; these are necessary so I can tell what is really in the rocks and not just end up going on past associations. Past associations can lead you in a right or wrong direction, and that direction may just depend on blind luck. So samples are necessary, geochemistry is required. And then I explain that I’m often working on a drilling project, whether it’s an early stage drilling project nearly immediately following the mapping and sampling phase or whether it’s an intermediate or end stage drilling program, where a mineral deposit of some kind has already been discovered or even partly drilled out. And that, once again, many samples with assays and geochemistry are required. Because, although a really good geologist can estimate copper grade in some kinds of deposits, gold grade is quite elusive, even in vein deposits where some of the gold might be quite visible. So, what is my most favorite thing? The problem I have with this question is ultimately my problem with having favorites. I used to be asked to say what my favorite color was. I had to make that up. Because, really, I didn’t have one. I like, and have always liked, a hell of a lot of colors. Some not so much, most quite well. For a while I really liked lavender, and then I decided to have blue as a favorite color, perhaps as a reaction against the ubiquitiously female pink. At some point I decided that I didn’t like green—that was after living on the east coast where all the overgrown vegetation was obscuring my view of the geology. Now, there really aren’t any colors I dislike completely, although there are several that I favor, including magenta, various shades of purple, and some shades of green—among many others. So, now we’ve established what I like best—and because I like rocks best, and because I'm an exploration geologist looking for minerals, a few things become required, whether I like them or not. These requirements generally include that I travel for work, because one usually runs out of backyard rocks fairly quickly, and because the mineral deposits I'm finding, mapping, sampling, drilling, and delineating aren't usually found in my backyard (somone's backyard, maybe; if they had been found in my backyard, I'd alreay be rich and would just be blogging and traveling for a living). Traveling, therefore, is a requirement. There are jobs that don’t require quite as much traveling; these are usually at or near mines. Some of these jobs require long commute times, and they usually require long working hours. By long commute, I mean as much as 2 hours in one direction. 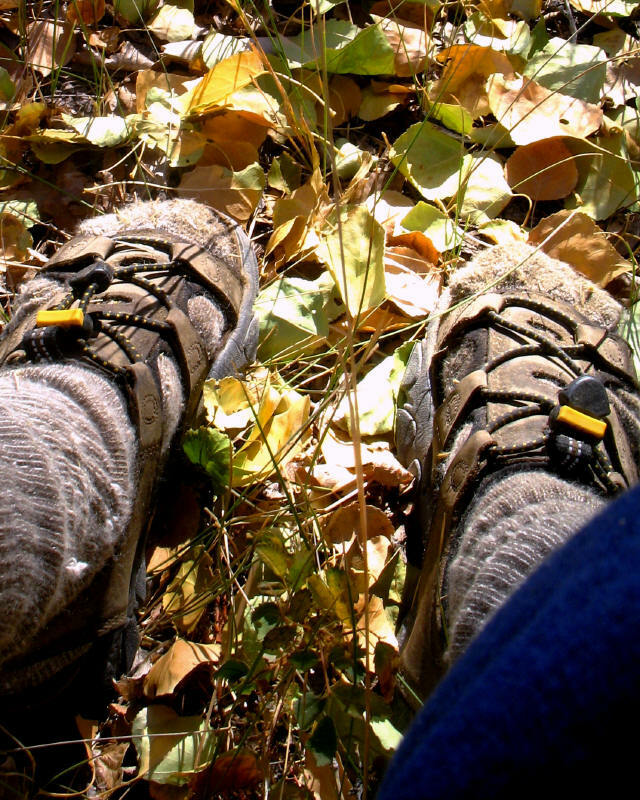 For compensation, the pay is often good, and sometimes the time off is good. Also, because travel away from home base is often required (except sometimes when working at mines), staying in motels becomes almost second nature. It used to be something I didn’t like, something that for some unknown reason even made me anxious. Now it’s nice to get away, at least for a while, and one reason that's so is that the rooms are almost always clean and not cleaned by me, and they have a greater feeling of space than the little house I currently live in. And what do I dislike about the life? (Yes, we call it that: the life, like we were in the mafia or something.) That can depend on a particular job, but one thing that can be bothersome is office-type politics. Traveling away from the office, if one happens to have an office, gets one out from under the keen eyes of sometimes overbearing or over-managing bosses, gets one away from gossip and other related office antics, and can allow one the freedom to do one’s job properly. 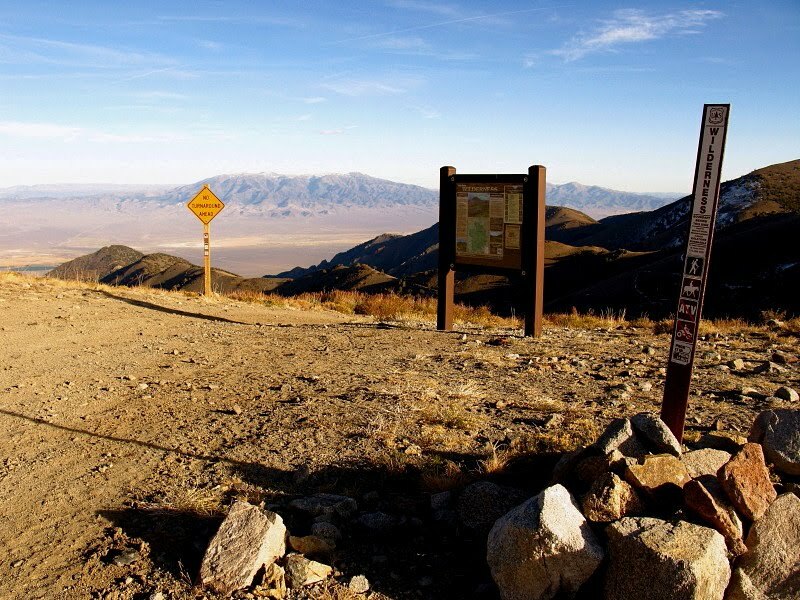 In the wide open spaces, one can feel free—even in these days of constant “on” required by cell phones and such, especially because cell service is not available in many prime exploration areas—unless one happens to be close to mines, freeways, major cities. Of course, by Nevada standards many of the “major” cities I’m referring to are quite small. Which is another good thing, for the most part. What I have found over the years is that almost all good things have their downside in some circumstances, that good things become bad things, maybe just with repetition, maybe just because of the oppositional nature of things—and likewise for bad things. The things I don’t like under some circumstances can become things I like under other circumstances, and the things I like can become things I don't like, at least for some time being. As far as using the things I like to motivate myself through things not liked: yes, I think I do that to some extent, but in some situations I’m more likely to motivate myself with things that arean’t strictly work related, by finding something that keeps my mind entertained or keeps me inspired. 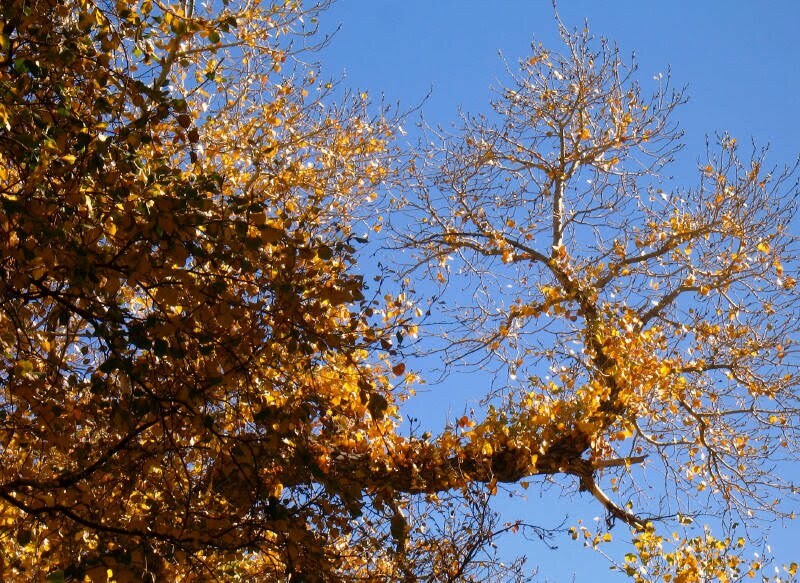 These things might be as simple as taking photographs when there is time, or finding something at work that I can do that is both helpful and personally rewarding, even though it might not be required or expected. And then other times I just plow through, knowing that mineral exploration is quite variable by nature, and that I’ll be doing something else soon, maybe tomorrow, maybe in a few months—but soon in the long scheme of things, and instantaneously by the standards of geologic time. Now we've climbed out of the canyon and have our first real view of the valley floor and the distant Toquima Range. And right around a narrow corner we go! Rocks on one side (and in the road), drop off on the other side. 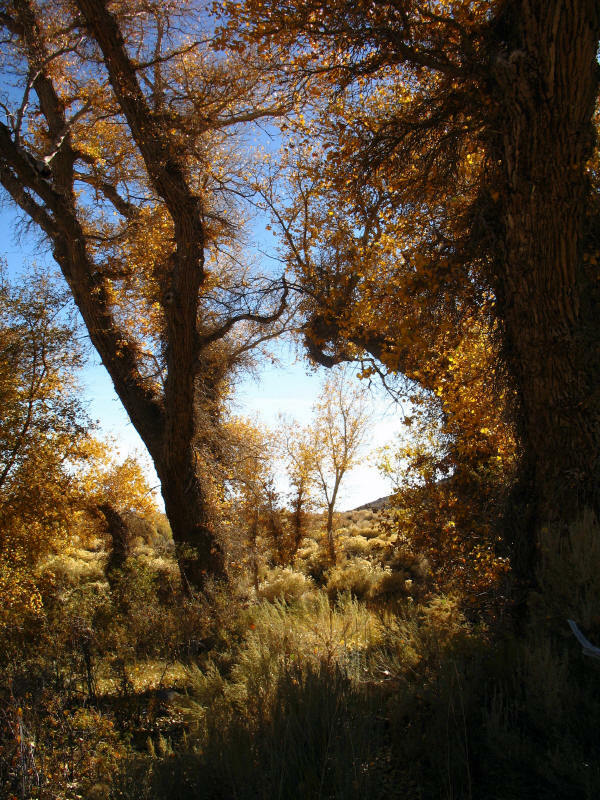 The aspens have mostly dropped their leaves at this elevation, which is about 8900 feet. We are now at Point F on my newly revised Google Maps route through Ophir Canyon (see Embed below), having come from Ophir at Point C.
And here's where I thought the road got interesting, and there was no way to get a good picture of it without backing down through parts I didn't want to back through. 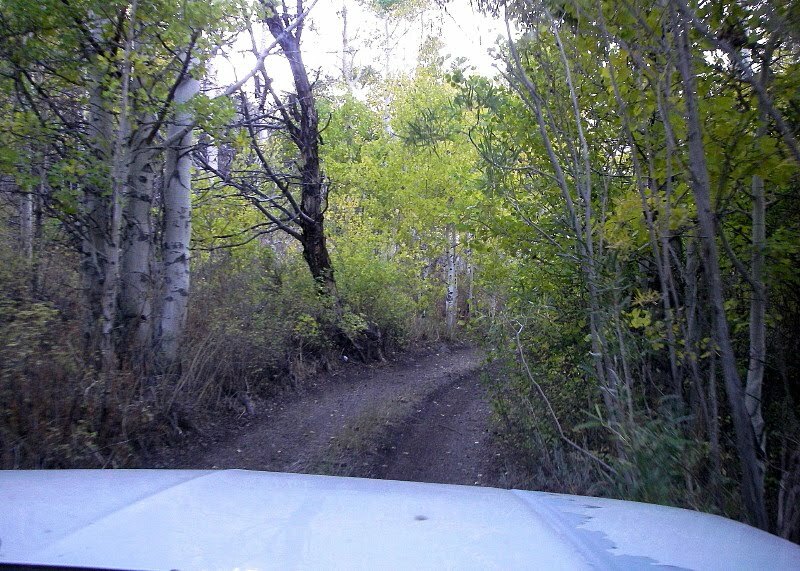 This is at about Point G.
I'm toodling along through dense, heavy brush and trees, at a moderately steep angle, driving along in the 2nd gear of 4 Low (4L or Low Range) — not in Low Low or the 1st and lowest gear of 4L. This 2nd gear of 4L is equivalent to the 1st gear of 4H, the gear below starting gear, which is called 2nd by Chevy. (These gears are numbered differently in Fords.) 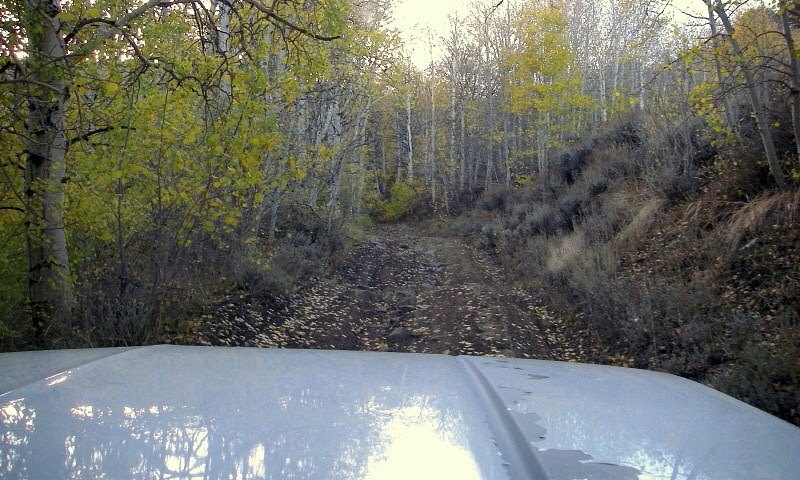 I come around some corner or through some extra-dense brush, and suddenly the road has pitched up to what looks like vertical ahead of me, and then the road disappears around a turn while going at this suddenly steeper pitch. Additionally, the road looks dark like it's muddy. The picture I took, above, was grabbed at a moment that didn't seem quite so intense; the other picture, below, was taken by MOH. Whew! 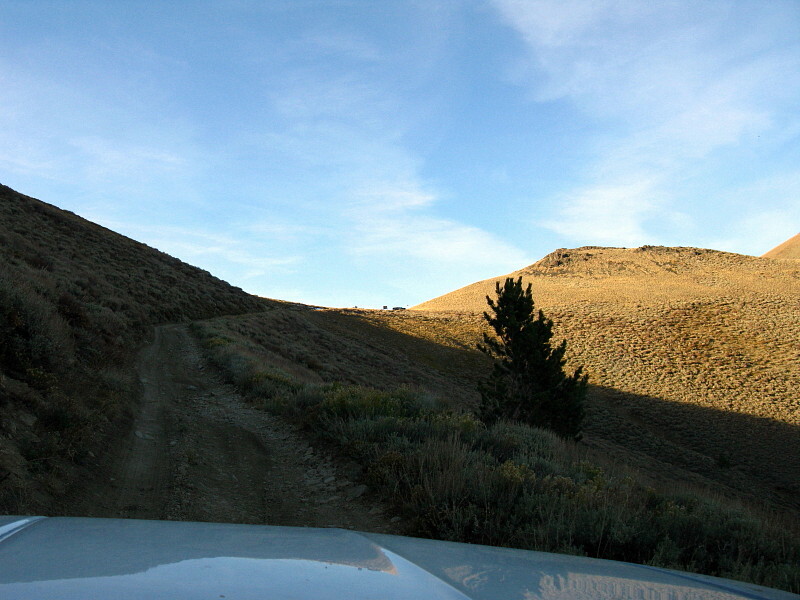 After gritting my teeth a bit and plowing through the steep part, not shifting down but just pushing on ahead, not knowing when the steep zone was going to end — it finally did, and the road came uphill into a wide junction area shown as Point H. This is the point at which Google thinks the road ends. Strangely enough, this is actually the point where the topo map shows the road becoming a double dashed road rather than a single dashed jeep trail. 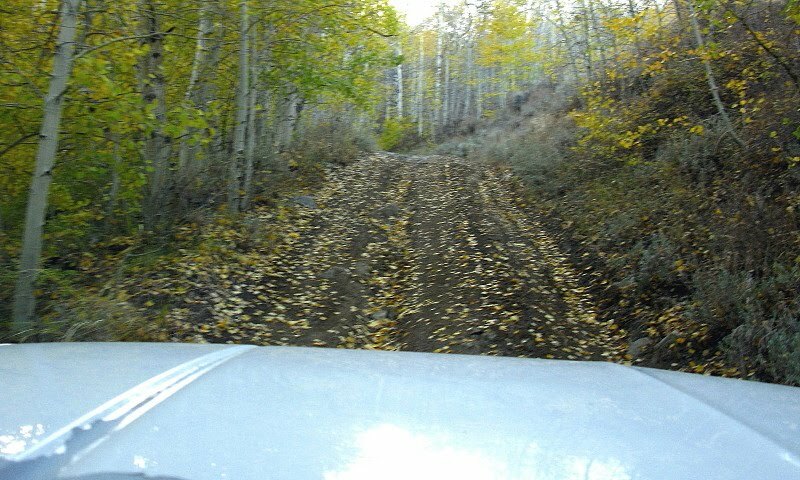 Through the steep part, it had been nice to see that the road had been driven by the vehicle that made the ruts, and nice to realize that the ruts had been made fairly recently, sometime after the last rain or snow, probably within the previous week or two. 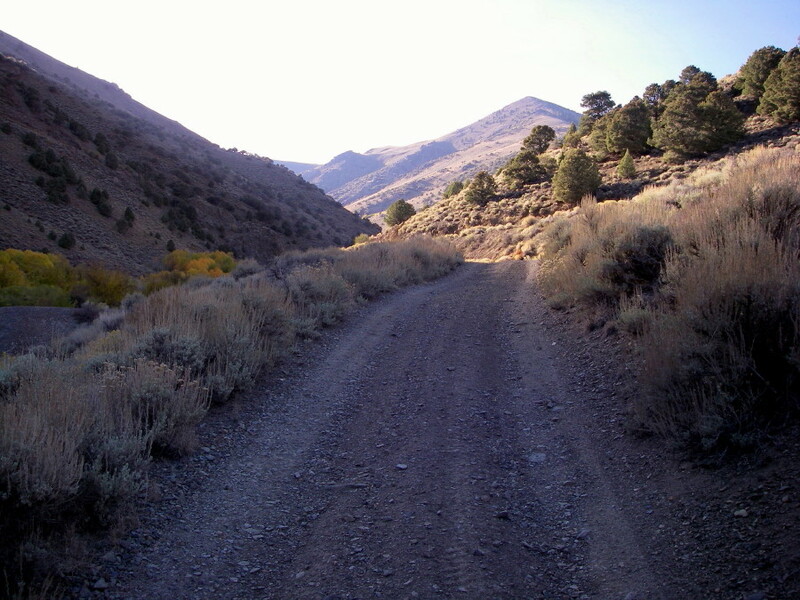 I usually feel better if there are tracks on a road, although a single set of tracks can end in a getting stuck point, sometimes with the vehicle that made the tracks still stuck in the mud, sand, rocks, snow, what-have-you. 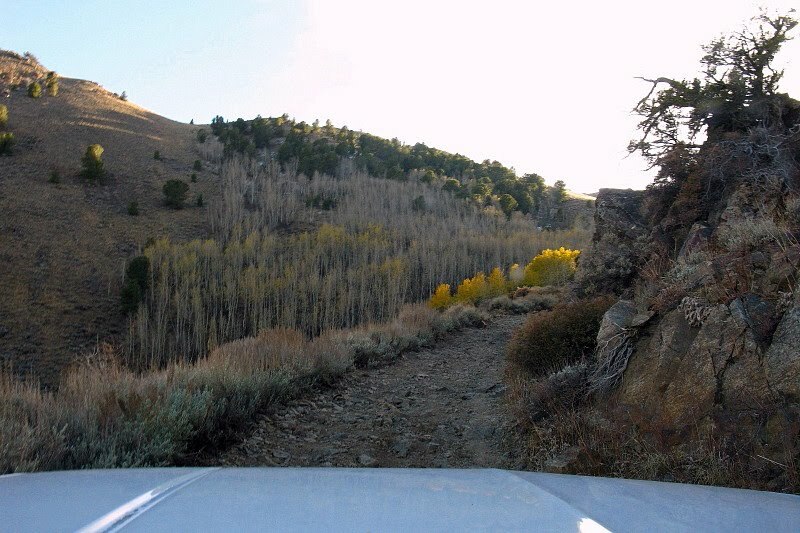 The junction, at about 9500 feet, is a nice place to get out and look at the view. This time, Mt. Jefferson is finally coming into view from behind the canyon ridge on the right. 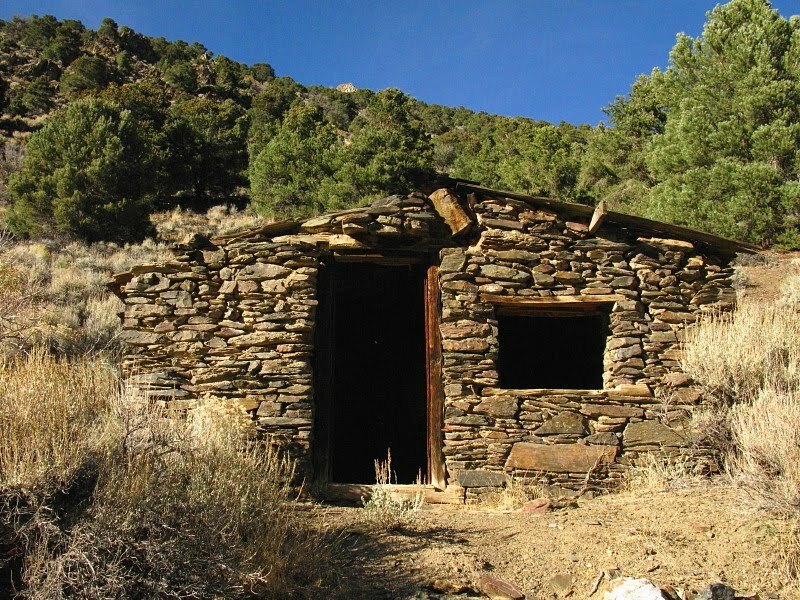 In a low spot in the Toquima Range between Mt. Jefferson to the south and Wildcat Peak to the north, you can see beyond to the Monitor Range. 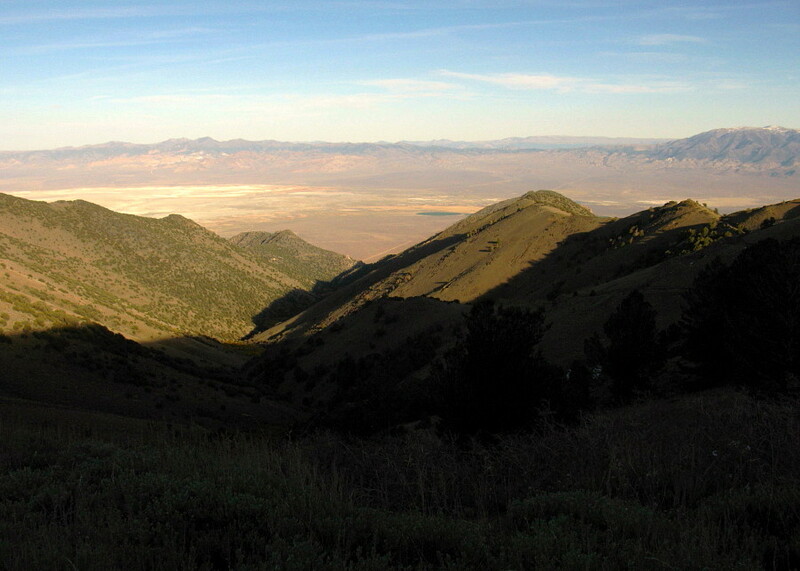 Wildcat Peak is the high point above the Big Smoky Valley playa. 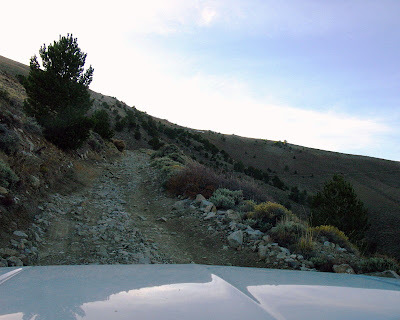 This part of the road — though steep, narrow, and a little rocky — was actually fun because we could see the summit ahead and knew that almost nothing would prevent us from reaching our goal. In fact, at this point I was sure we would make it. Prior to that, I didn't know if we would have to back down because of snow or other unexpected occurrences. 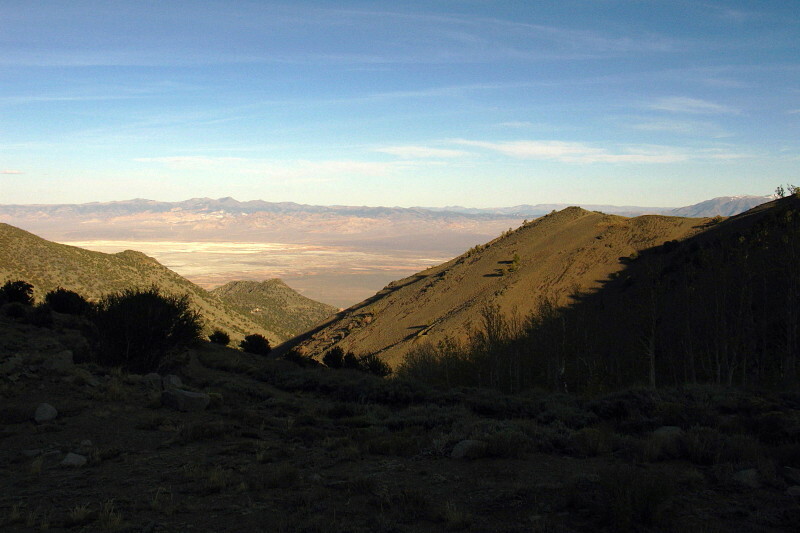 This is very much the same view as the last one, but from about 9900 feet. 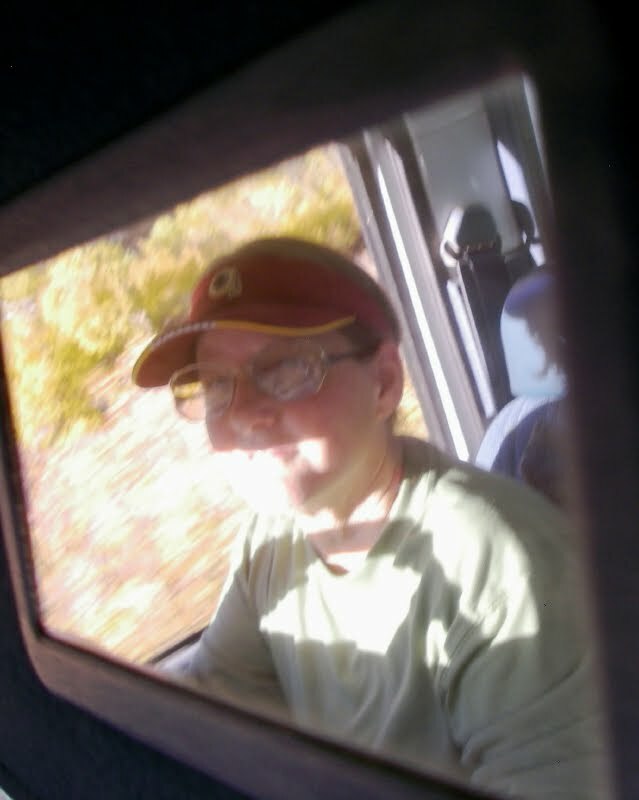 I've taken the picture by just pointing my camera in the general direction of the passenger side window, which is rolled down for picture taking. (And then I rotated the resulting tilted photo.) 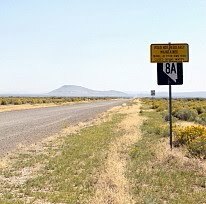 Also note that the alluvial fan road we came in on is visible beyond the mouth of Ophir Canyon (embiggen at will), as is old Highway 8A, heading straight to the south toward Carver's Station. That's the saddle ahead! 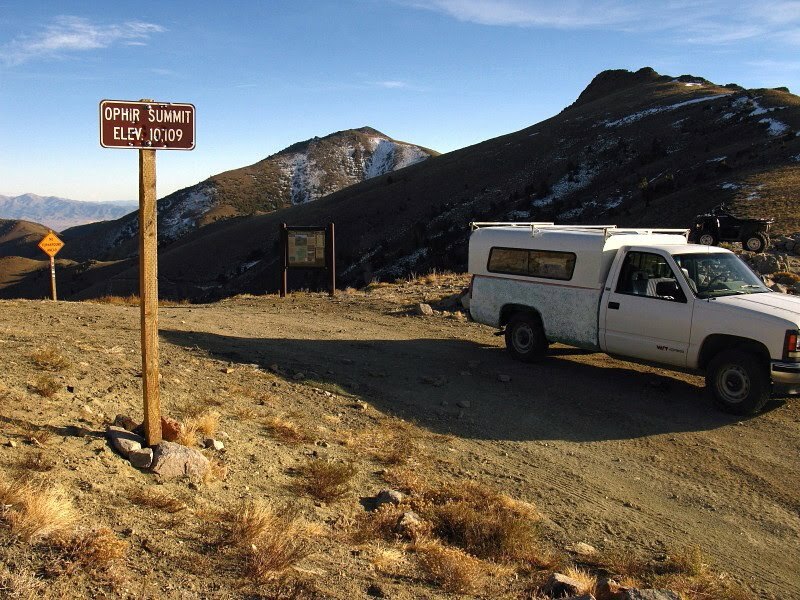 Ophir Summit at 10,109 feet! 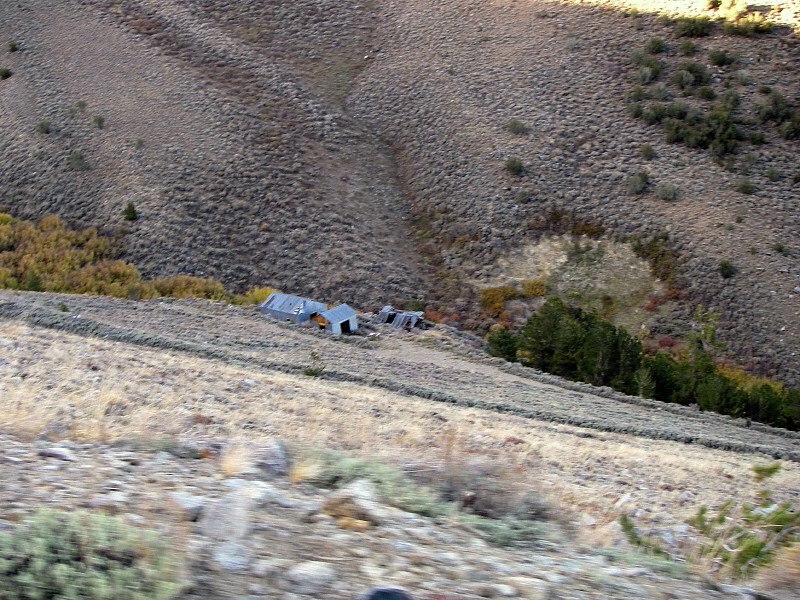 The small objects are one hunting pickup truck, one hunting ATV, and one wilderness sign. 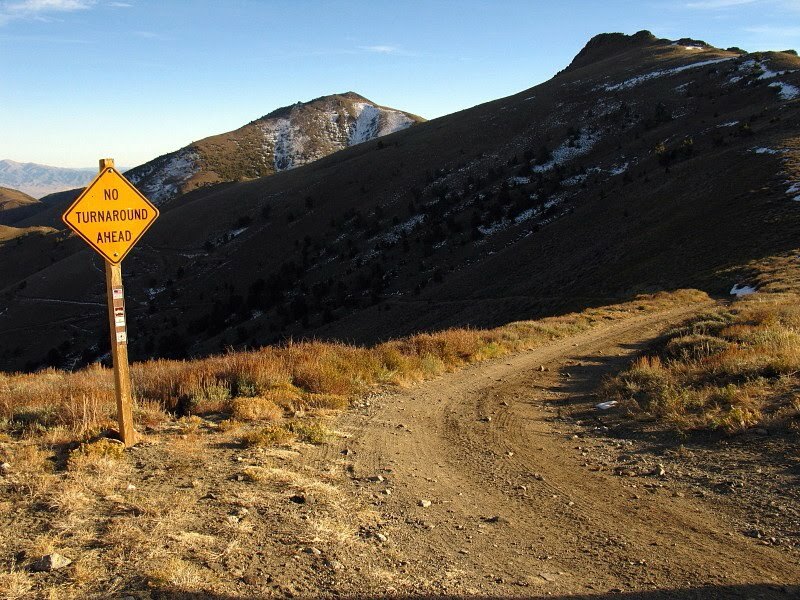 Signs at the summit are myriad, including the summit marker and a sign for the Arc Dome Wilderness area, which begins to the south, just behind the truck. More signs, including the marker on the right telling you what can't be done in the wilderness area. That's Mt. Jefferson behind the yellow sign. The sign says, No Turnaround Ahead, looking back down the road we just came up. Gee, thanks for the warning! 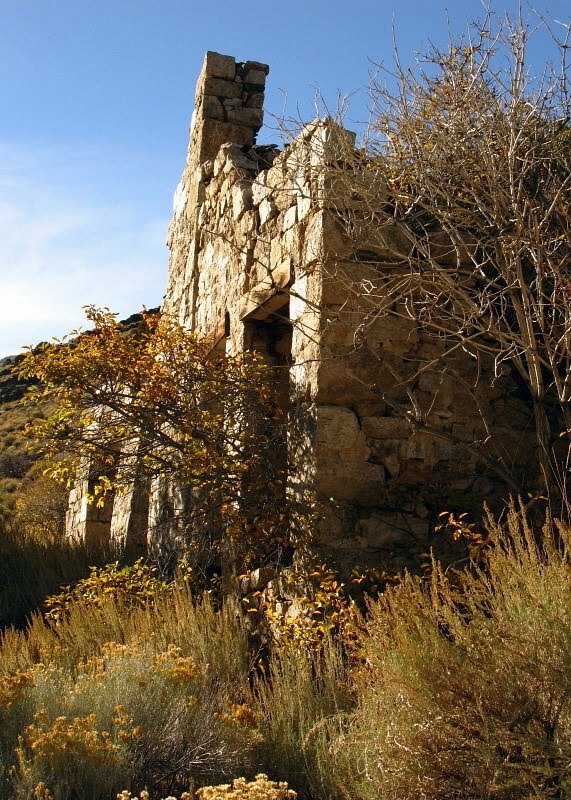 All told: about 30 minutes for the lower canyon, 15 minutes in Ophir, and about 40 minutes for the upper canyon. I recommend starting earlier in the day, not at 3:30 pm the way we did! This month's Accretionary Wedge is being hosted by Matt Kuchta over at Research at a Snail's Pace, and it's all about deskcrops, "the spookier the better." I missed the fisrt Accretionary Wedge on Deskcrops, which was Wedge #4 at Goodschist, although I've featured a few random deskcrops now and again (exactly two, so far). 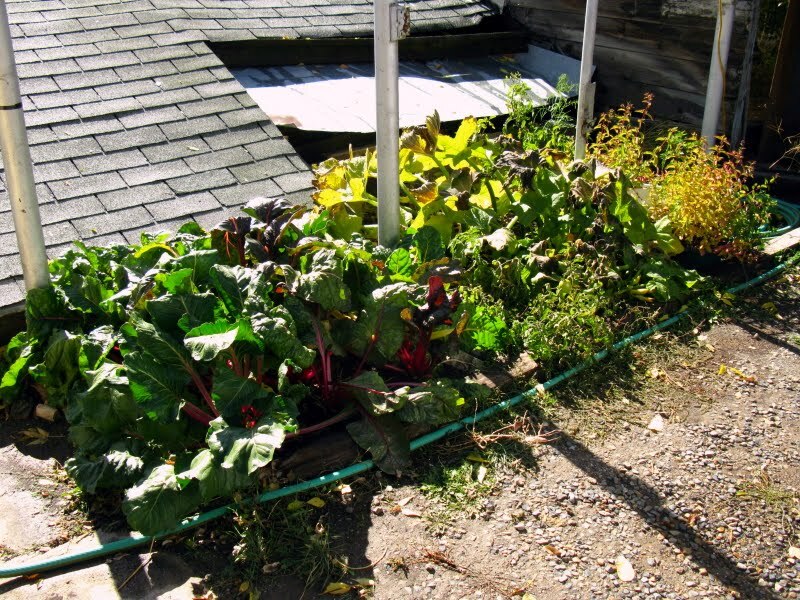 And, as I explained elsewhere recently, I don't really have a desk, and will have to use either shelfcrops from inside the house, garden crops, porchcrops from the steps near the back door, or back-of-truck-crops. I had one vote for garden crops and one vote for porchcrops, but am going with a spooky little indoor shelfcrop. Scale: Entire rock is 3cm in diameter. MOH brough this little gem home from a hike one day, and it was immediately in the running for top shelfcrop, seeing as how Halloween is nearly upon us and it resembles an cheerfully smiling jack-o-lantern. It has a big grin, one partly squared off round eye, and one triangular eye. In reality, it's a dark gray, brecciated dolomite (now running out to the truck to get the HCl in order to test this diagnosis - yes!). 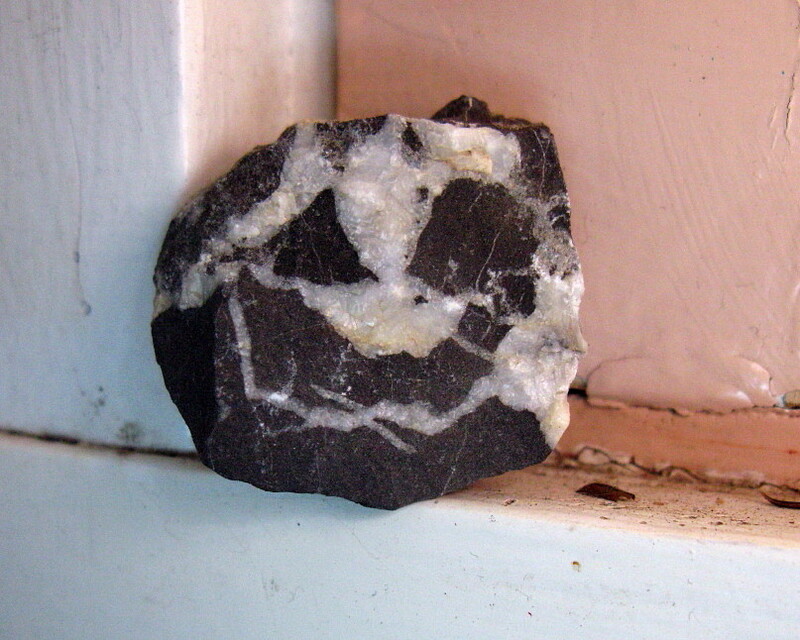 Some breccia clasts appear to have been rotated or at least moved (the triangular eye) while others appear to be nearly in place (part, or even most, of the smile); the clasts were then cemented by a matrix of white, coarsely crystalline calcite dolomite (HCl to the rescue). This is a sedimentary rock (dolomite) that has been brecciated under unknown circumstances, given that the context (an outcrop) is missing. Consequently, I don't know what kind of breccia this is. Possibly it's a karst breccia; maybe it's a hydrothermal breccia; maybe it's a sedimentary breccia that was cemented with dolomite. 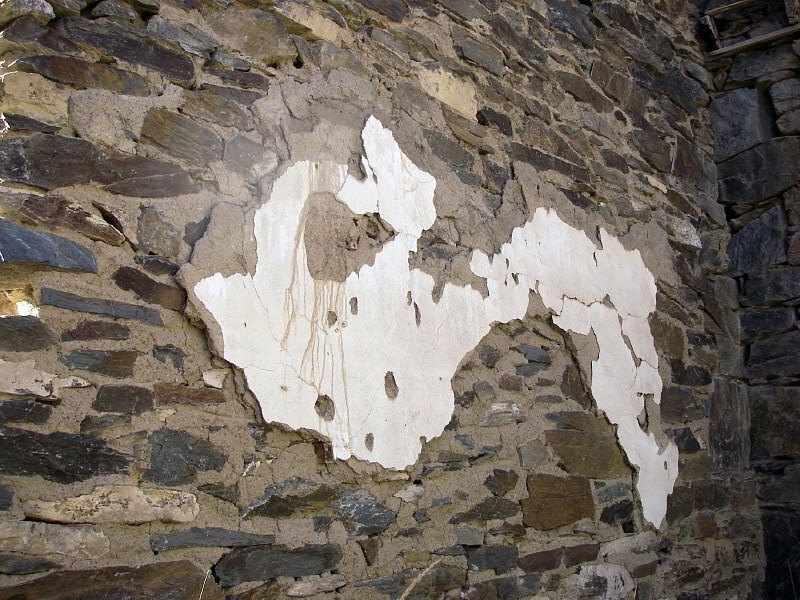 Maybe it's some kind of fault or tectonic breccia. Just don't know. ...and then this. Purple outlines the breccia fragments; dark pink follows veinlets. 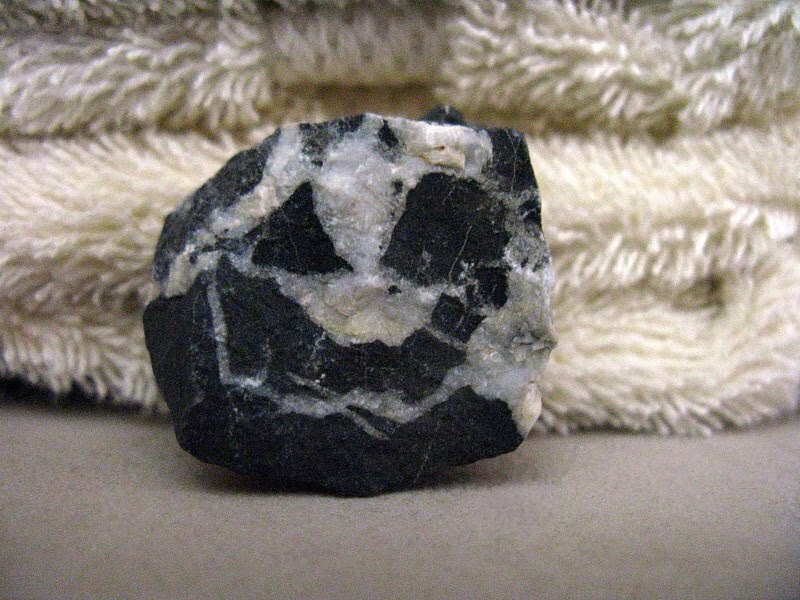 And here's our grinning jack-0-lantern breccia in it's current home, on a shelf, leaning against a folded towel, making it truly a shelfcrop, and a top shelfcrop, at that! We had our first snow early this morning, although it was very light as far as accumulation. Here is the sum total that stuck on our garden plants. 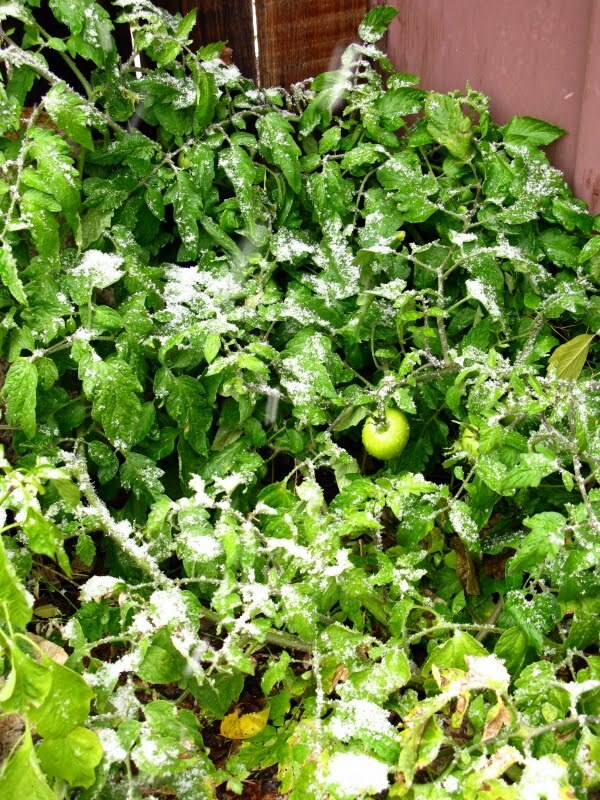 A pair of tomatoes face the snowfall in our front yard garden area, which overall was not as productive as the backyard area. Within two hours all the snow had melted, and the sun was out for most of the afternoon, until some low scud clouds blew in just before sunset. 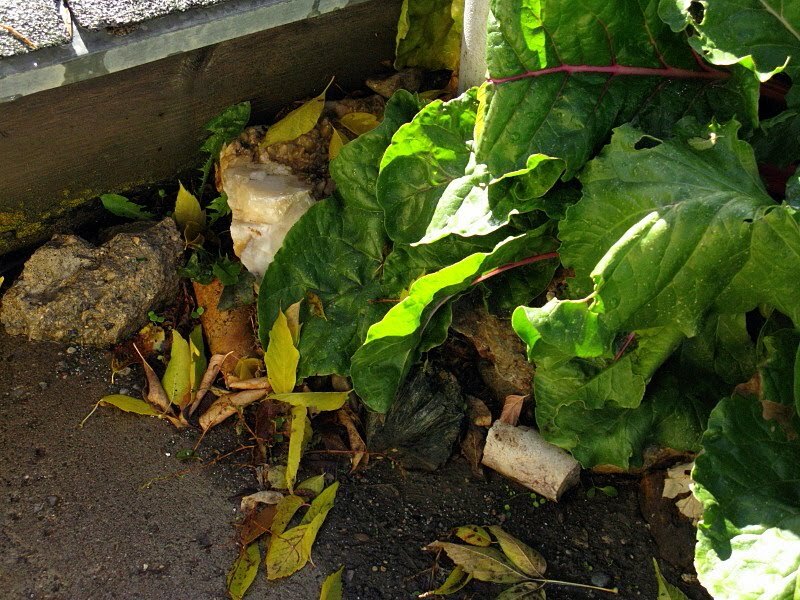 And here's a few of my garden rocks; most are buried beneath Swiss chard leaves. 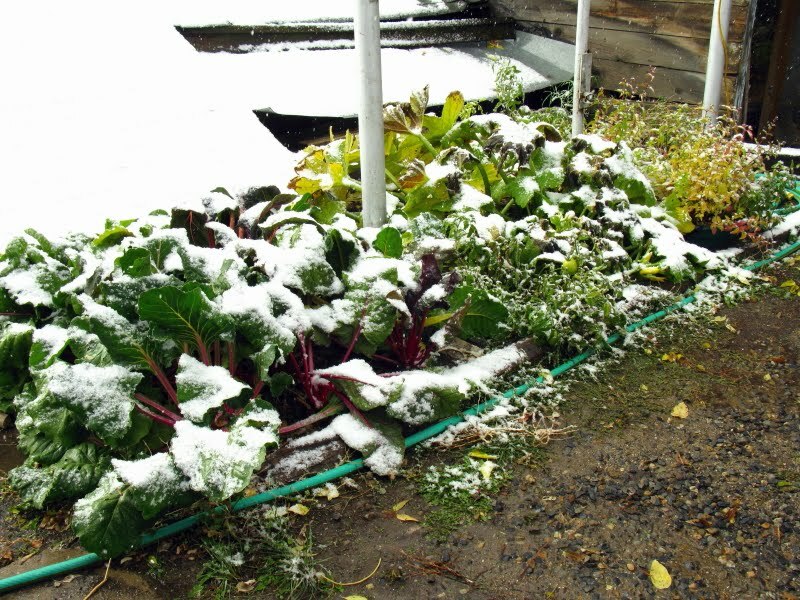 The chard is holding up well, though I keep hearing that temps are going to drop below 20° F, any day now. No snow on these leaves, which I swear were redder than what I could photograph. 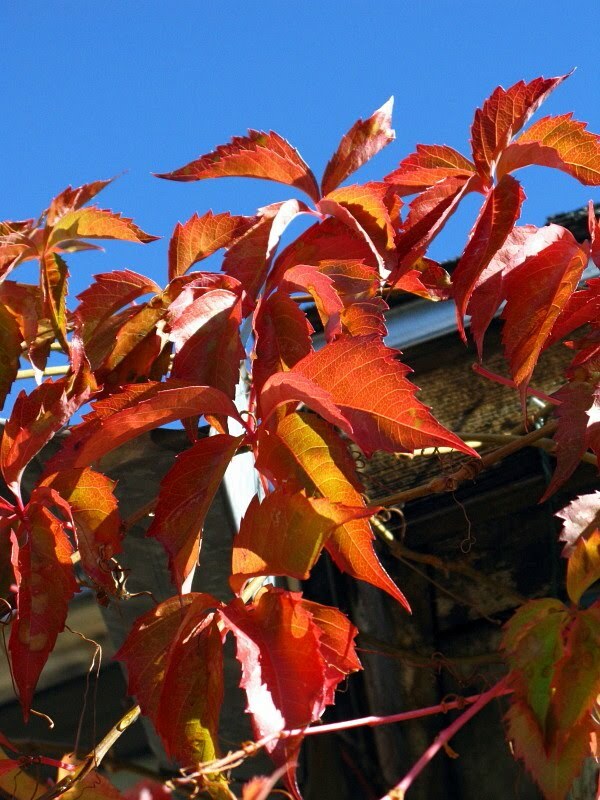 These fallish leaves were spotted while I was meandering about on my afternoon walk. The first snow of 2007 was on October 6th. The first snow of 2008 was on October 10th. The first snow of 2009 was on October 4th. The first snow of 2010 was on October 25th: considerably later, but it could have snowed lightly last week when we weren't here, though temperatures suggest otherwise. UPDATE 27Oct2010: The first hard freeze of 18° F came early this morning. It had frozen and slightly wilted the chard yesterday, but this morning, gardening ended. Now, blanching begins! 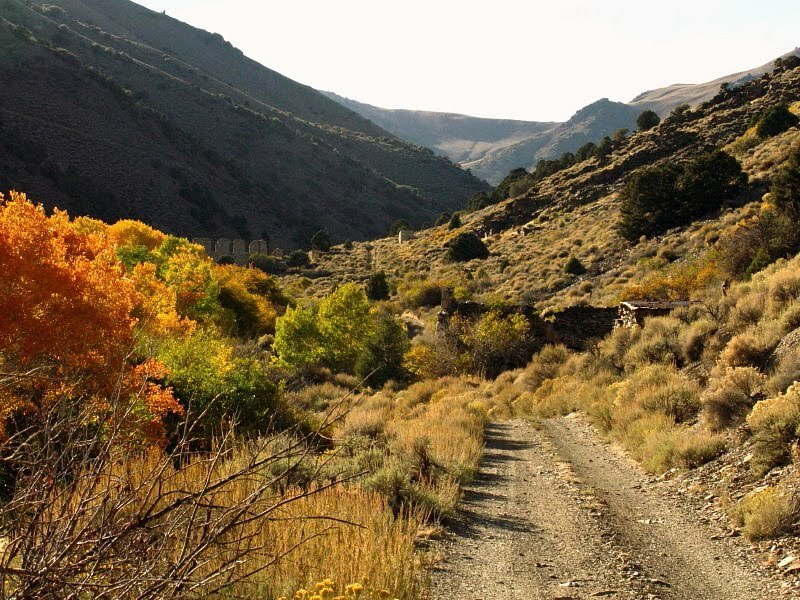 Taking a quick break from our regularly scheduled Backroads:Ophir editions, I'll flash back to another creek on the east side of the Toiyabe Range of central Nevada, that being Bowman Creek, which I visited two years ago in search of lost memories, lost campsites, and lost people. 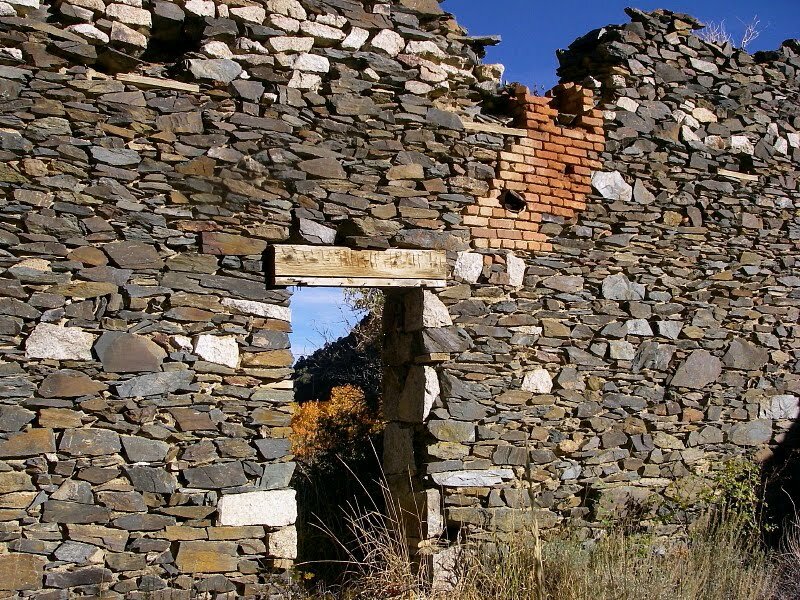 While at Bowman Creek — two years ago today — I drove up the dirt road on the south side of the Bowman Creek fan to an area with some old buildings, including this run-down stone cabin. I don't know anything about the history of these buildings; they are located near a little turnout in the road south of Bowman Creek (MSRMaps) and camoflauged by trees in the related airphoto. 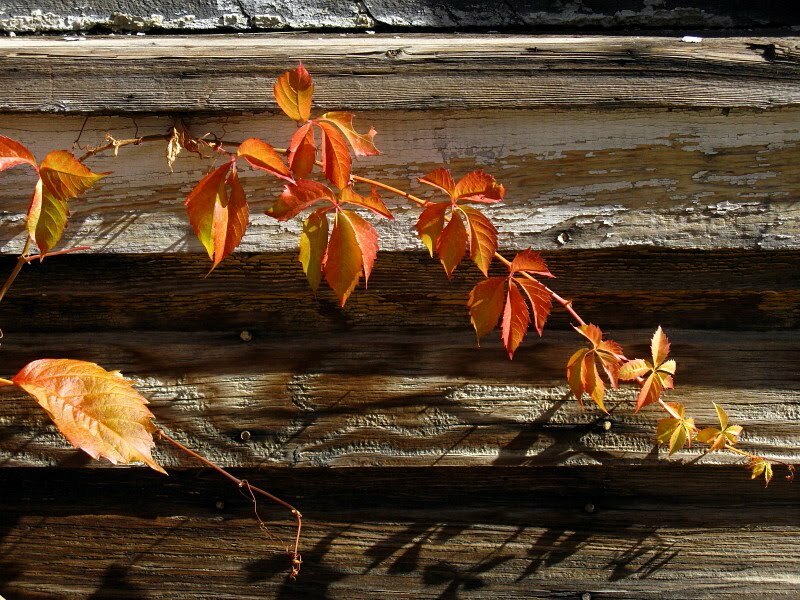 It was autumn, the leaves were falling, and the old cabins or homesteads were picturesque. 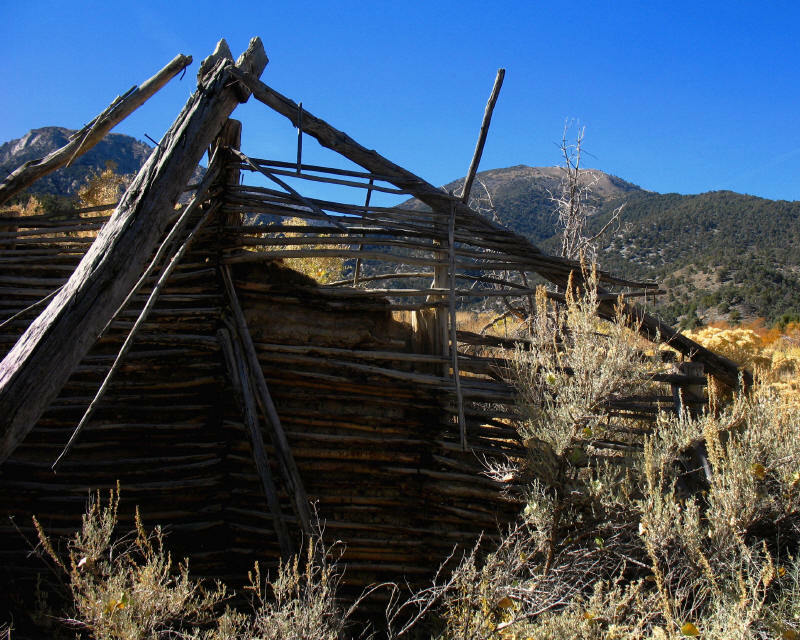 This is the larger and more intact of two wooden buildings, made of logs, beams, and boards, with lots of clay chinking. 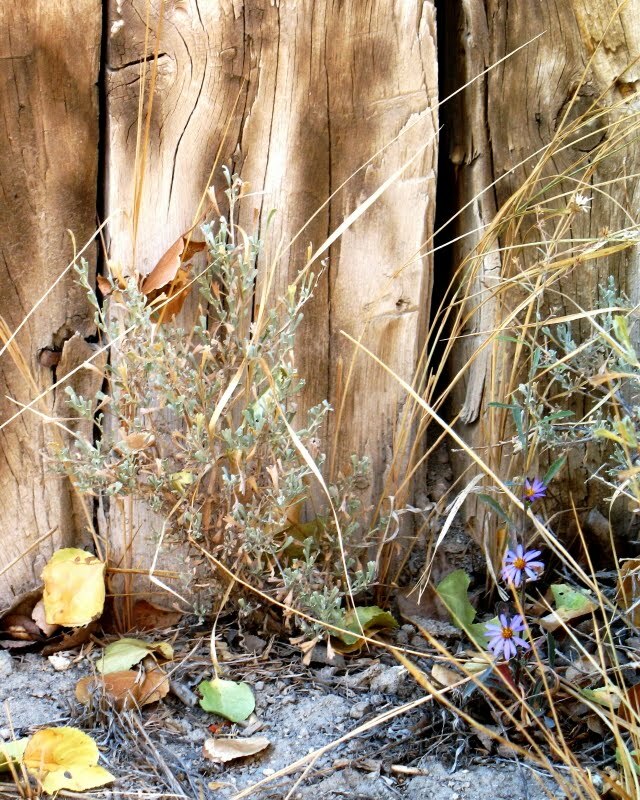 Some purple daisies or asters, sagebrush, and fall leaves near the doorway of the larger wooden building. 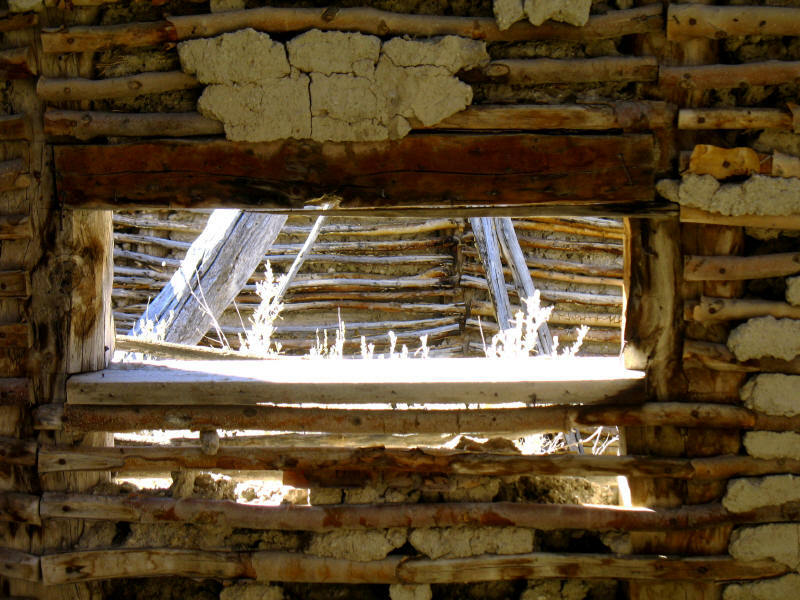 ...and I could see blue sky through the rafters. 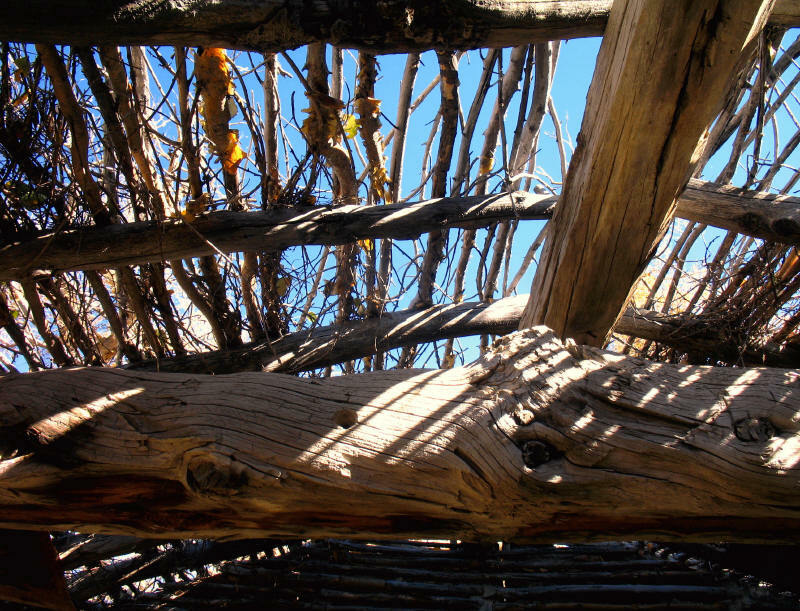 The partially collapsed, second wooden structure. 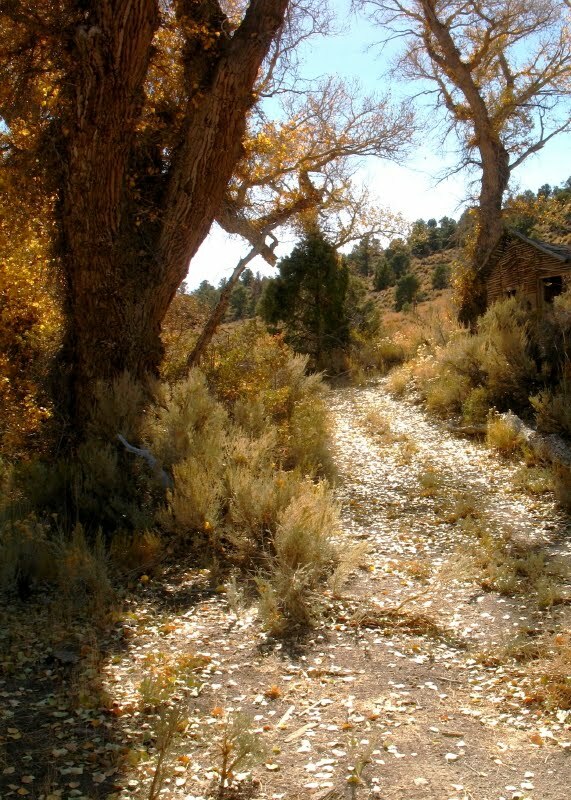 I wandered on down to a patch of tall cottonwood trees just below the dirt road and old cabins. Because of the trees, I suspect this was a ranch area, although there are a few prospects and old mine adits up Bowman Creek, so the buildings could have been old miner's shacks. 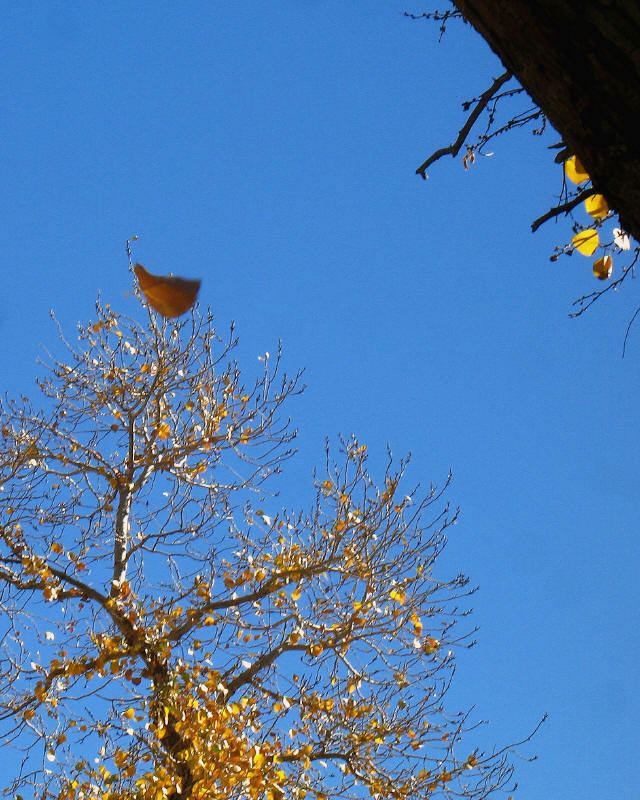 The wind was blowing and leaves were falling. ...I headed back down the road. 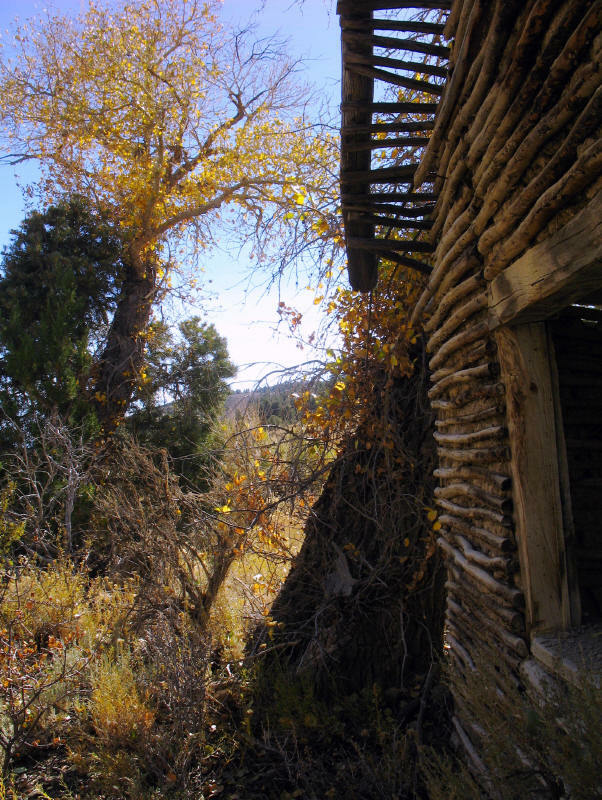 This must be one of the most photographed cabins in Ophir: it's the first one you come to from the downhill side, and it's right along the road. In fact, all the buildings we saw were right on the road, because we didn't take the time to walk around. 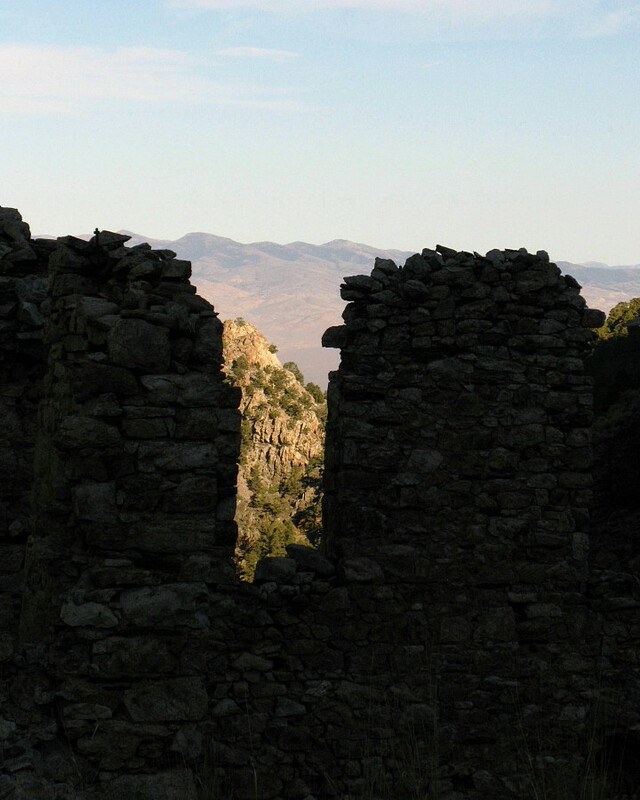 There are, however, enough buildings, partial buildings, and old ruins that real exploration would take at least an entire day. (MSRMaps location; Google Maps route). This multi-room sturcture is right on the road, not far past the first one. At least two sites report this as an old store front. After milling around outside a bit, we went inside. 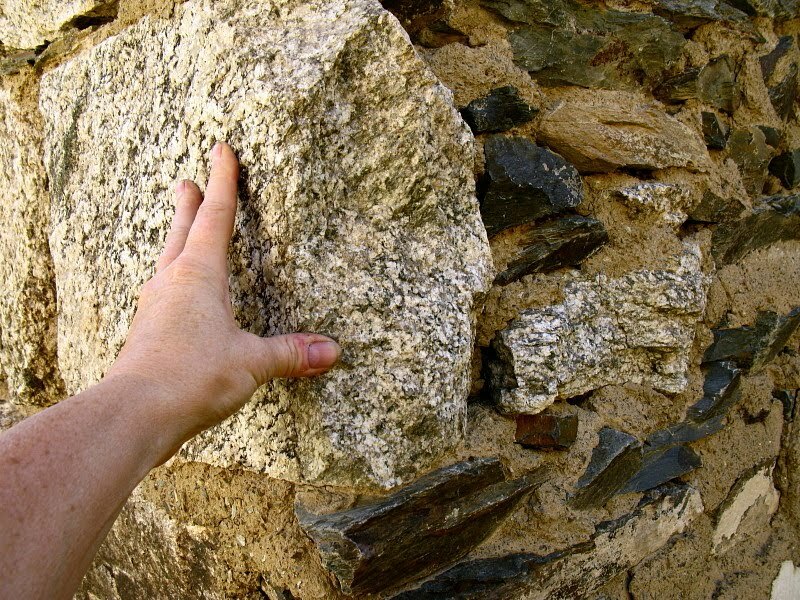 I was fascinated by the rocks the walls were made of, especially this weakly foliated granitic rock. 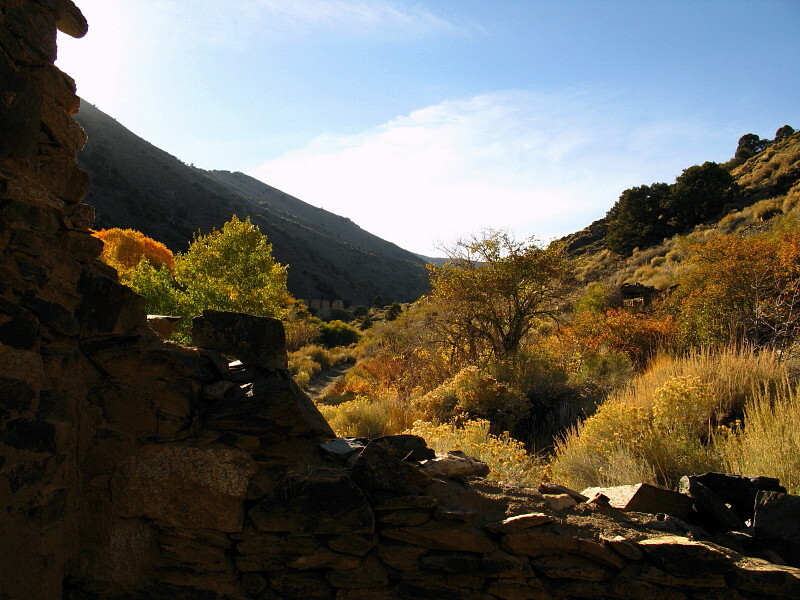 There are several granitic plutons in the region, including a small stock that crops out near the head of Ophir Canyon. Details about the various granitic rocks were hard to come by online, with suggested ages ranging from Jurassic to early Tertiary. The dark greenish gray slaty phyllite could be from one of several Paleozoic formations (see map below). 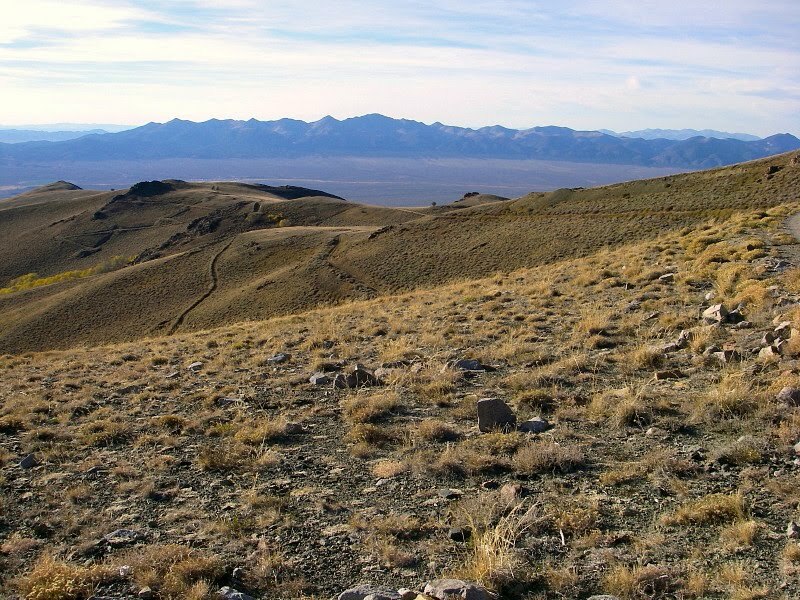 From the Geologic map of the Tonopah 1 degree by 2 degrees quadrangle, central Nevada by Whitebread and John (1992). PMp = ?? This is probably the Mississippian to Permian Pablo Formation, which was listed in the map explanation as Mp. 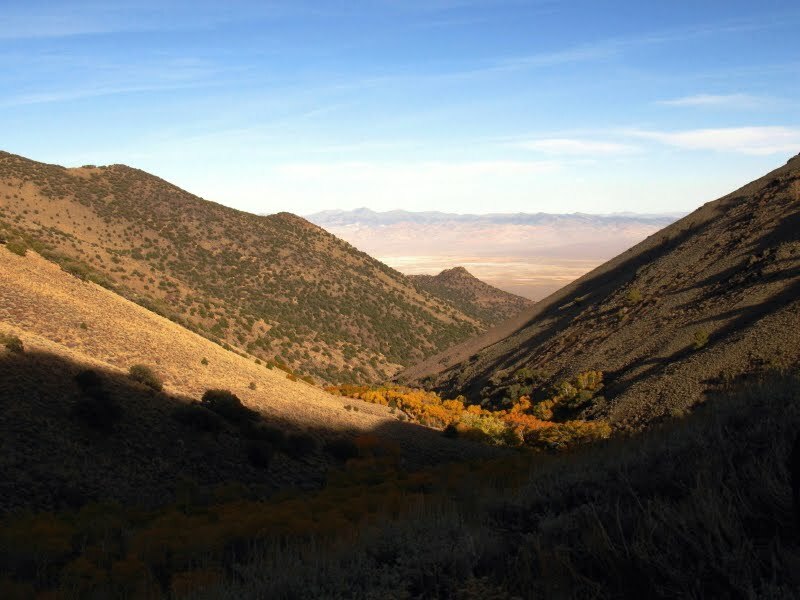 The main part of the Ophir mining district, including the Murphy Mine, which was the major silver-gold producer of the district back in its day, is in that structural mess where a couple north-south-trending thrust faults are shown. 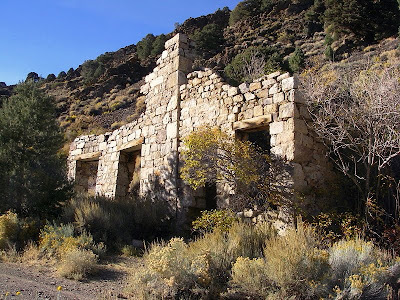 The mines in Ophir Canyon are commonly listed as being part of the larger Twin River mining district, and the town of Ophir was once called Toiyabe City. Although almost all online references state that the Murphy Mine (or the entire Ophir Canyon district, or even the entire Twin River district) produced $2 million worth of silver and gold, Kleinhampl and Ziony (1984) report a much lower figure, something closer to $800,000 for the entire Twin River district. 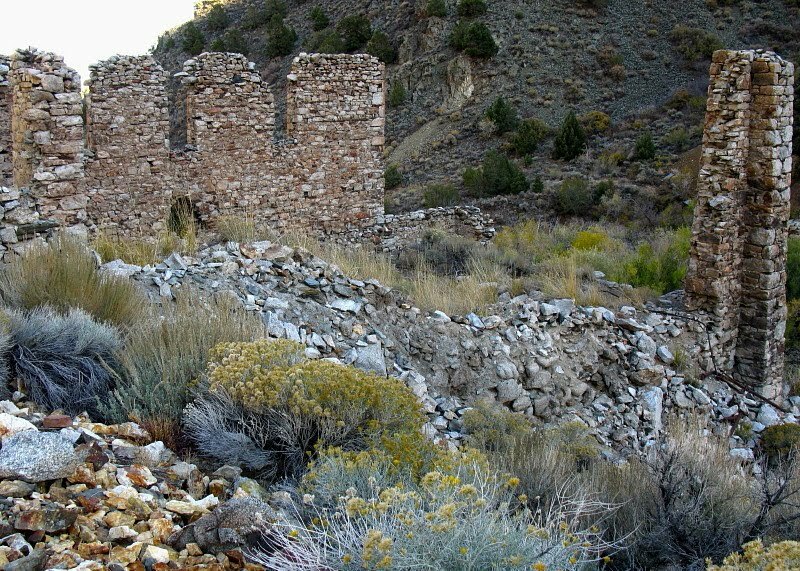 Most of the gold and silver production came from Ophir Canyon; most of that came from the Murphy Mine. 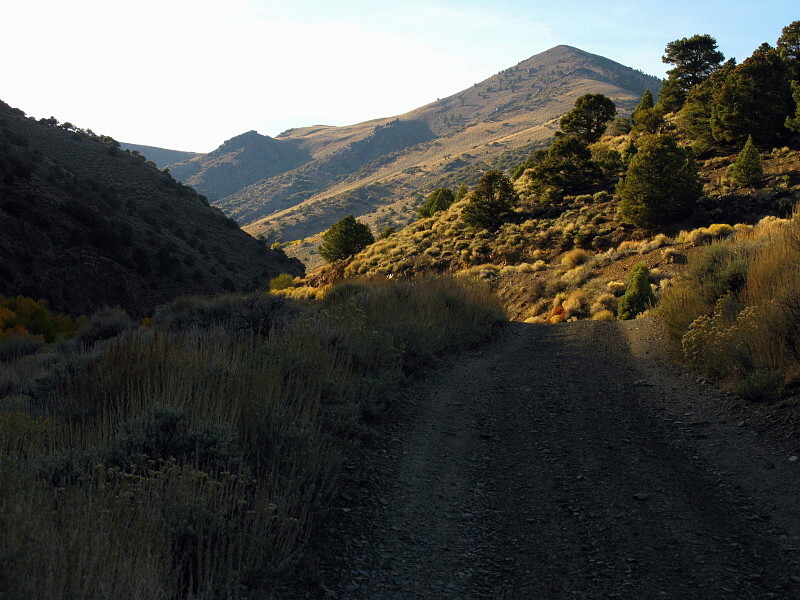 Meanwhile, the sun was getting incrementally lower, and I was looking up the canyon, thinking about moving on. 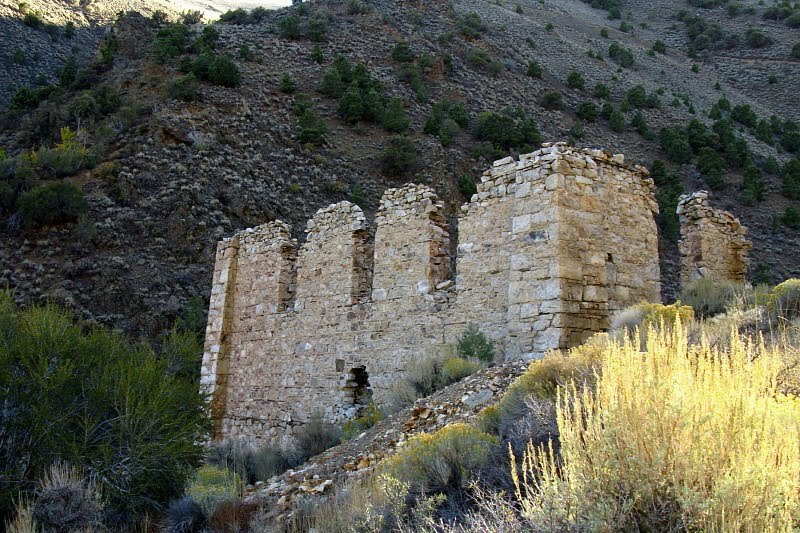 This may be the largest structure in the old town of Ophir, again, right along the road. 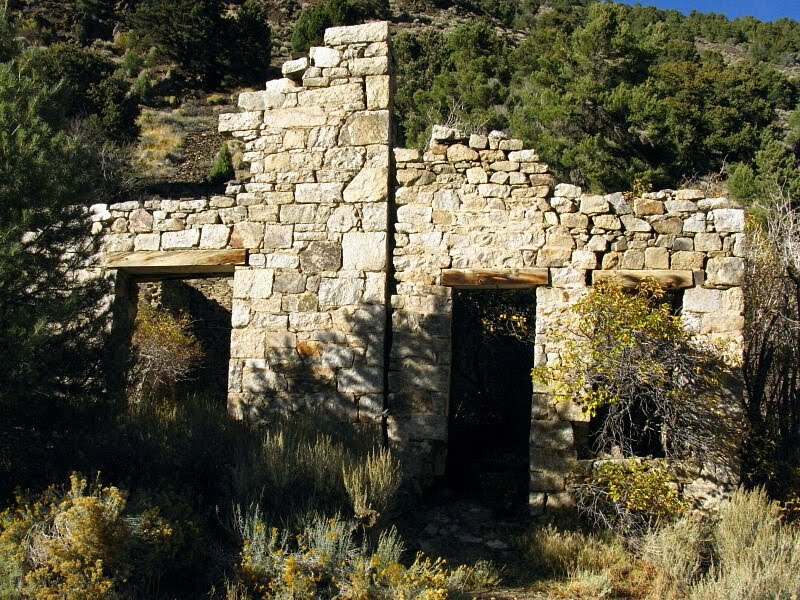 It's the remains of the old 20 stamp mill, located just below a large mass of mine dumps. Here's another view of the old mill, this time looking back towards the east. 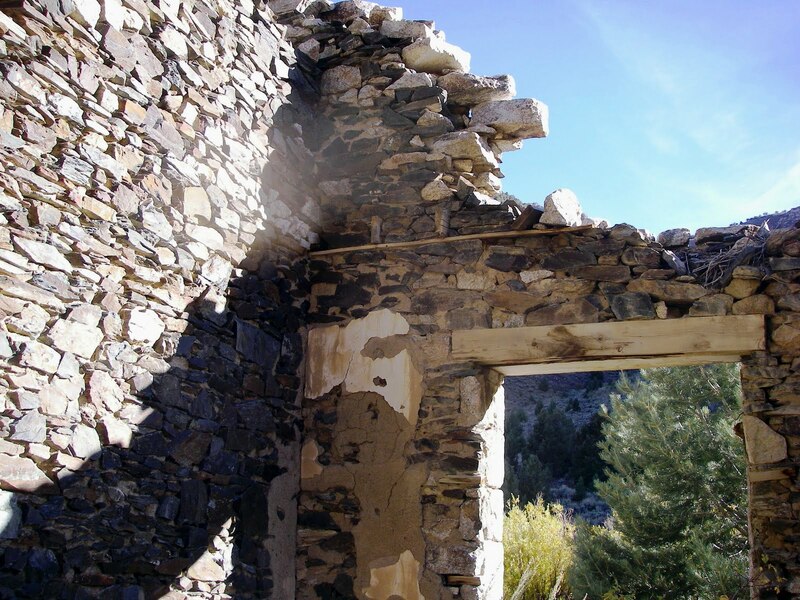 Part of the Toquima Range through old windows (I presume) in the Ophir Canyon mill. At last, after less than 15 minutes according to the time-date stamp on my photos, it was time to head up the canyon. 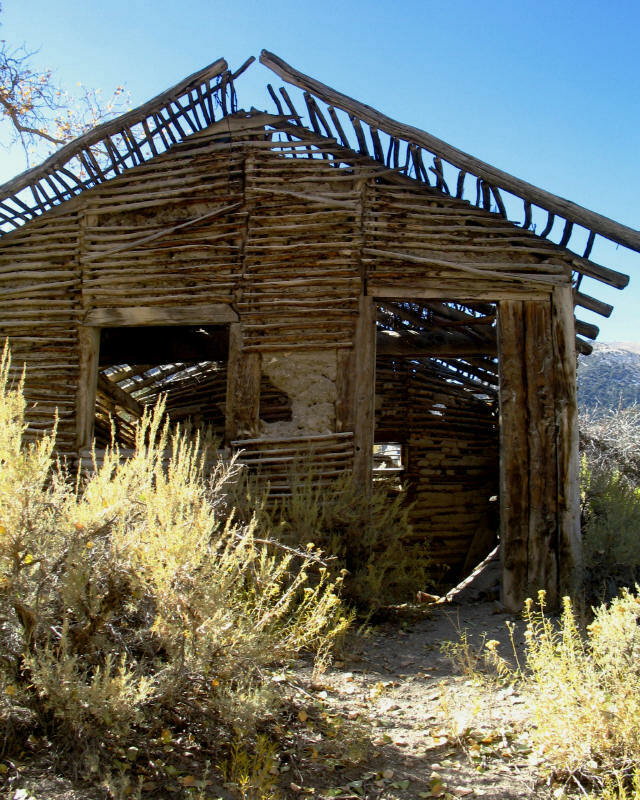 Angel , Myron, 1881, History of Nye County, Chapter L in History of Nevada: Thompson and West, Oakland, California. Kleinhampl, F.J., and Ziony, J.I., 1984, Mineral resources of northern Nye County, Nevada,: Nevada Bur Mines and Geology, Bulletin 99B. NBMG Bulletin 99B [first pages only]. Whitebread, D.H. and John, D.A., 1992, Geologic map of the Tonopah 1 degree by 2 degrees quadrangle, central Nevada: U.S. Geological Survey, Miscellaneous Field Studies Map MF-1877-A, scale 1:250000. 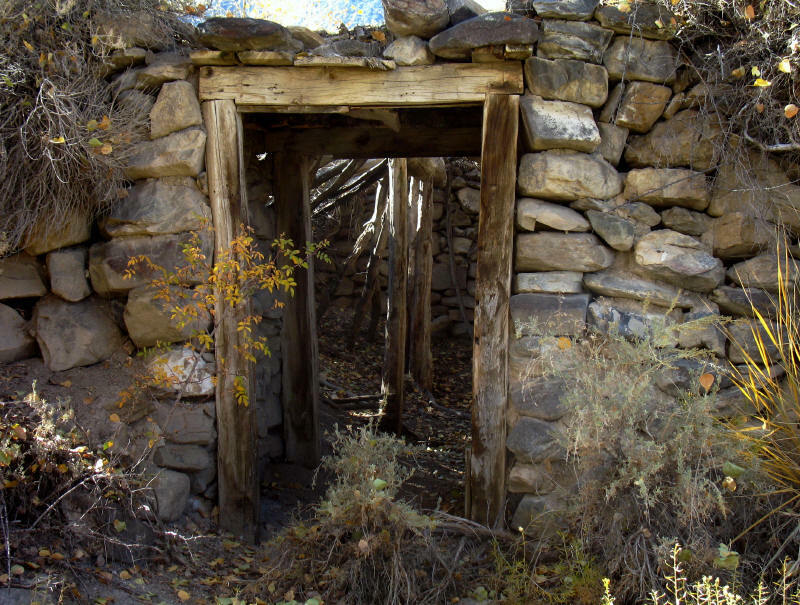 Ghost Town Seekers: Ophir Canyon and the Murphy Mill!